Ile - Ife Heritage Marathon Organization [IHMO], Organizers of the maiden edition of Ile - Ife Heritage Marathon have confirmed participation of some world notable marathoners ahead of the maiden edition of the much talked about destination marathon scheduled to hold on Sunday 4th of February, 2018 in the ancient City of Ile Ife. 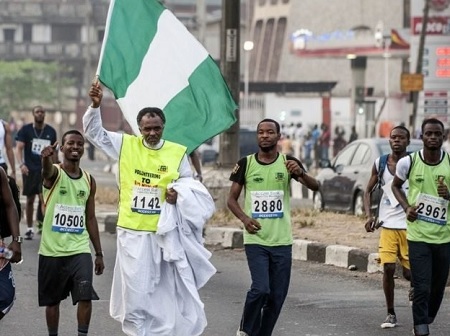 The Race Director of the Ile - Ife Heritage Marathon , Adedayo Akinbode,disclosed that preparations are in high gear to host a world class marathon event in Nigeria. “We are excited to confirm the participation of some world renowned Marathoners ahead of the first edition of Ile Ife Heritage Marathon coming up on Sunday 4th of February 2018. Prominent among the expected runners are the Race Director of the Baobab Marathon in Burkina Faso, Dr. Christoff Lindenbeck and Professor Klaus Westphal, who once held the world record of running marathons in the most numbers of countries”, Adedayo noted. certified route recorder in Nigeria. Our desire to stage a destination Marathon and showcase to the world, the rich cultural heritage of the Yoruba People through Ile - Ife’s several heritages sites is coming to reality’’, the race director declared. "We have received strong assurances from the Nigerian Police authorities in Osun State for adequate protection of lives and property in and around areas where the Marathon race will hold. This gives the expected visitors some level of confidence as to their security. The Federal Road Safety Corps [FRSC] and all key government agencies are working together with us to achieve a successful outing. Students of the Obafemi Awolowo University have equally turned out en mass to support the participants by volunteering their services during the event. The organizing committee will be happy to see Ile -Ife people come out to cheer runners as they take a tour of Ile-Ife",She said. Adedayo added that the Organizing Committee members are ultimately grateful for all the support received from the Government of the State of Osun led by Governor Rauf Aregbesola and the Ooni of Ife, His Imperial Majesty, Oba Enitan Ogunwusi towards the successful hosting of the destination Marathon . The event is expected to give tourism a huge boost as visitors experience the warmth and hospitality of the Yorubas and Ile-Ife in particular as they visit the National Museum next to the Palace of the Ooni Ife, the World Ifa Temple, the Opa Oranmiyan Staff and the Grand Ife Resort which the Ooni personally invited them to visit. Prior to their arrival in Ile-Ife, runners will have a stop over in Osogbo where they will embark on a guided tour of the Osun State Capital. The historic race, which is expected to award Finisher Medals and Finisher Technical Tee Shirts to all Finishers is one of the 7 Marathons comprising the 2018 West African Marathon Challenge series. The Race which provides a veritable platform for the originator of the Ile - Ife Heritage Marathon to give back to the society that nurtured and moulded her between the ages of 15 and 20 when she was an Engineering Student of the then University of Ife is expected to become a runners delight.